This five star retreat has attracted a fair few celebrities over recent years, from actors to musicians, and a couple of US Presidents for good measure (Jimmy Carter and George Bush snr, to be precise). However, for the history buff it will be Lainston House’s association with King Charles II that will be of most interest. Indeed, it is said that the hedonistic king visited the property with his mistress Louise de Keroulle. The building itself dates from the 1600’s and might be described as pretty rather than grand (though sizeable it certainly is). However, the history of the estate clearly goes back far further than the 17th century as is evidenced by the 13th century chapel to be found in its grounds. 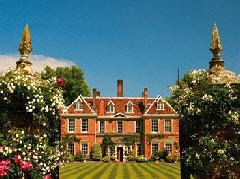 It offers 50 guest rooms in all, including a number of suites such as the Wolvesey, Garden and Chapel. It should be noted, however, that all rooms are individually styled. Dining options at Lainston House include the award winning Avenue Restaurant.